The Alfred Dunhill Links Championship in St Andrews is played annually in October as part of the European golf tour over the Old Course, Kingsbarns, and Carnoustie and is one of the most prestigious and richest events on the tour. 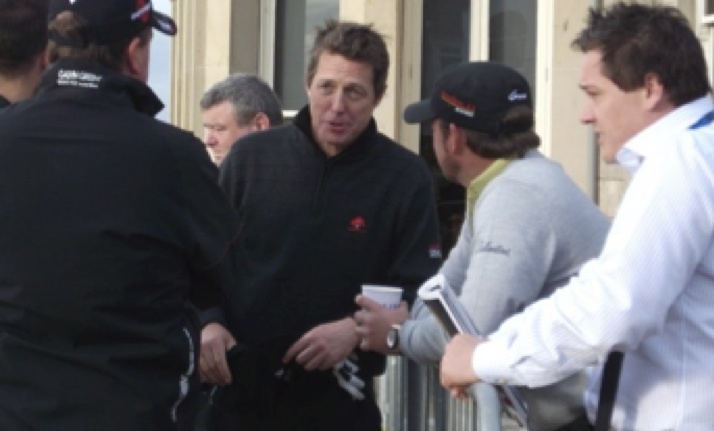 The tournament has also become the main attraction point for movie stars to St Andrews since the tournament became a pro-am in 2001. Stars such as Samuel L. Jackson, Hugh Grant and Michael Douglas return year after year to compete in the tournament. The presence of these stars, and the well known fact that they are regularly seen by members of the public out and about in the town, is a big drawing point for tourists and locals alike. Local, national and even international press are all quick to publicise stories and anecdotes that describe, for instance, how Bill Murray attended a St Andrews party and ended up doing the dishes, or how Hugh Grant got a little bit too friendly with a group of second year girls back in 2007. During the event St Andrews town is taken over by the Hollywood bug, with fans taking to the greens to catch a glimpse of their favourite stars whilst the press scramble to snap up the latest star story. The stars themselves frequent many of the restaurants and bars around the town, interacting with local business owners, students and tourists. It is these local interactions that lead to the Dunhill being a hotbed of gossip for the press. The small town atmosphere of St Andrews means that bumping into a celebrity is a likely occurrence during the week, and this fosters a feeling of prestige about the town, as celebrities and fans rub shoulders in restaurants or bars. The Dunhill is an event that only takes place over one week in October, yet star tourism can be found all year round in St Andrews. In order to keep star tourism alive, businesses around the town have begun to create a St Andrews ‘Walk of Fame’. If you take a walk around the town, many of the restaurants display pictures of stars that have visited their restaurant in the front window or in the welcoming foyer. Some examples of this are Maisha, Balaka, Jahangir, Rendezvous and the Ardgowen Hotel. This practice not only promotes the business as worthy of big name stars, who have experienced the best restaurants and hotels in the world and therefore act as a mark of quality, but it also makes the location become a stop on the Walk of Fame. Even those who miss out on the action of the Dunhill can experience their own little bit of Hollywood in St Andrews as a result of this specially cultivated star site all year round, feeling as if they are close to certain stars who have stepped foot in the same places. Many businesses also promote their famous visitors in their advertising, websites, and Facebook pages, thus making the information available worldwide and not just available to those directly in St Andrews. All these sites, however, are but brief stops in the lives of the likes of Hugh Grant or Samuel L Jackson. They may only visit St Andrews once a year, yet their influence is a year round presence. This is what makes St Andrews such a unique example of a star site. It is so not because of its immediate link to the film industry, but because of its links to golf. St Andrews is a place where fans can come to see how their favourite stars spend their time outside of the backlots and studios, thus situating the star as an ‘ordinary’ person, as well as someone of note. Jonathan Wynne-Jones, ‘Bill Murray Turns Fiction into Fact’, The Telegraph (15 October 2006). Richard Simpson and Sarah Bruce, ‘The Night Hugh Grant ended up in the arms of a gaggle of student beauties’, The Daily Mail (8 October 2007).